This is an easy and delicious homemade, eggless vanilla ice cream with condensed milk (Milk maid ) and Fresh Cream (Amul Fresh Cream) without ice cream maker. Usually people make ice cream at home easily with heavy whipping cream and sweetened condensed milk by just blending them together in a mixer or churn in an ice cream maker. 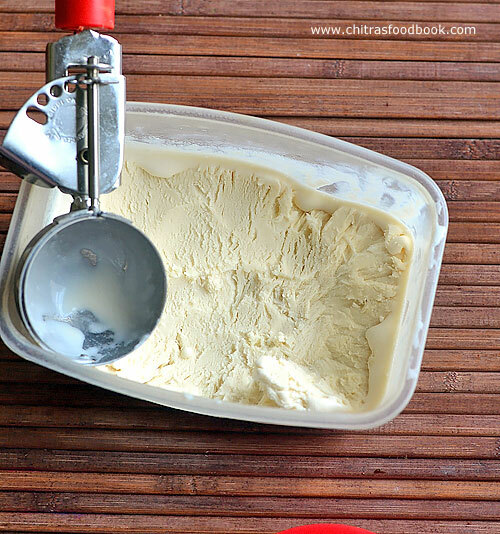 Its really the easiest and perfect method of making homemade ice cream. It comes out super rich, creamy and soft just like store bought ones even without using ice cream stabilizers like CMC and GMS. But in India, heavy whipping cream also known as double cream or high fat cream (more than 25% fat) is not widely available in all the super markets. 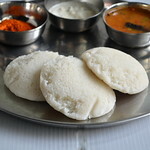 In Bangalore, I buy them from baking supplies stores, Metro Cash n carry, Nilgiris and very rarely from online stores. But Amul Fresh cream is easily available all over India. 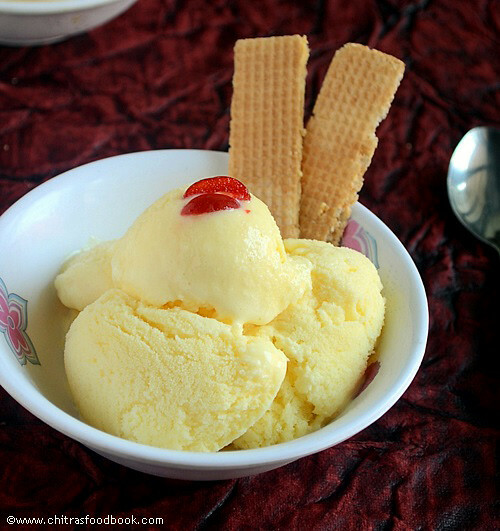 So this year I wanted to make this basic ice cream using Amul Fresh cream and sweetened condensed milk(Milk maid or Amul mithai) as it would be helpful for many of my readers who dream to make homemade eggless vanilla ice cream with easily available ingredients. I followed Cooking shooking video and Huma in the kitchen YouTube video for tips and tricks to make a perfect vanilla ice cream without ice crystals. To my surprise, it came out very well with rich lovely taste. Sendhil and Raksha loved it very much and gave a big thumbs up. In fact they liked this ice cream more than store bought ones. Being a big fan of Kwality walls and Arun Ice cream, I would say it tastes equally good but we cannot achieve its texture or stabilization as store bought ice creams. This ice cream melts sooner than the one made with heavy whipping cream and store bought ones. But this recipe would make you feel proud of making your own ice cream at home without any fancy ingredients or ice cream maker. All you need is an electric blender. Indian mixer will also work but an electric hand blender can do the perfect job for you by whipping the fresh cream to the right consistency. Friends, If you have electric hand blender at home, you can make this ice cream mixture in the next 15 minutes. Its so easy and quick. 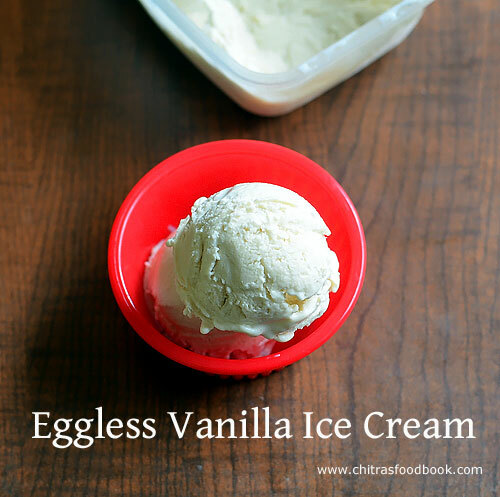 Do try this easy vanilla ice cream at home without egg, ice cream maker and share your feedback with me. 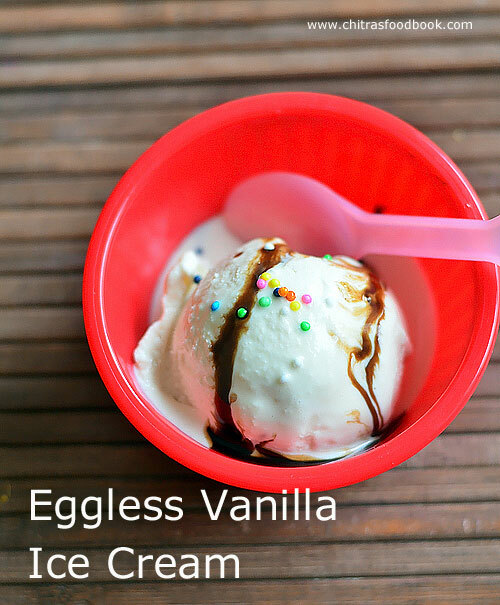 Lets see how to make this basic vanilla ice cream with step by step pictures and VIDEO. Eggless Vanilla ice cream recipe with condensed milk and Amul fresh cream - Basic vanilla ice cream recipe without ice cream maker. Cut open the Amul Fresh Cream Pack and scoop out only the thick part of cream. Reserve the liquid part and use it for garnishing the gravies. In a wide bowl, take the thick fresh cream and beat till thick using an electric hand blender. Add condensed milk, vanilla essence. Beat again to mix well. Transfer to an air tight container. Cover the top of ice cream with butter paper and close tightly with a lid. Freeze for 6 to 8 hours or overnight. Remove the butter paper, scoop out and enjoy garnishing with chocolate syrup and sprinklers or nuts ! Refrigerate the Amul fresh cream over night. The next day before making the ice cream, take out the fresh cream. Do not shake the pack. Cut open the pack. Scoop out the thick part of cream and add to a bowl. Do not take the liquid part. Reserve and use it for garnishing gravies. Take an electric hand blender and whip the cream for 5 to 10 minutes in low speed to high speed whenever needed, till cream becomes thick. Cream should form a soft peak. Do not over beat it. It may turn to butter. Add condensed milk and vanilla essence. Whip again using the blender till everything is mixed well. 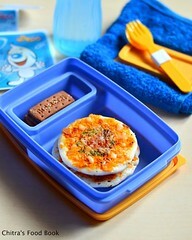 Transfer it to a clean plastic box/ Tupperware box or aluminium bowl. Take a butter paper and cover the ice cream mixture with it. Make sure that the butter paper touches the ice cream surface. Then close the box with a tight lid. It helps to prevent the formation of ice crystals over the ice cream. Freeze the ice cream for 6 to 8 hours. Overnight freezing is the best. The next day, take out the box. Open the lid and peel the butter paper. Scoop out the ice cream and serve in a bowl. Drizzle with chocolate syrup ( I used Hershey’s chocolate syrup) and decorate with sprinklers and nuts if you like. Serve immediately. Please note this ice cream melts quickly than the ice cream prepared with heavy whipping cream. So consume it quickly after refrigeration. It stays good for a week. Enjoy ! Amul fresh cream works the best. But use only the thick portion of the cream. Avoid the liquid part as it prevent the cream to thicken soon. You can keep this as the basic ice cream base and make chocolate ice cream, butter scotch and mango ice creams with slight variations. 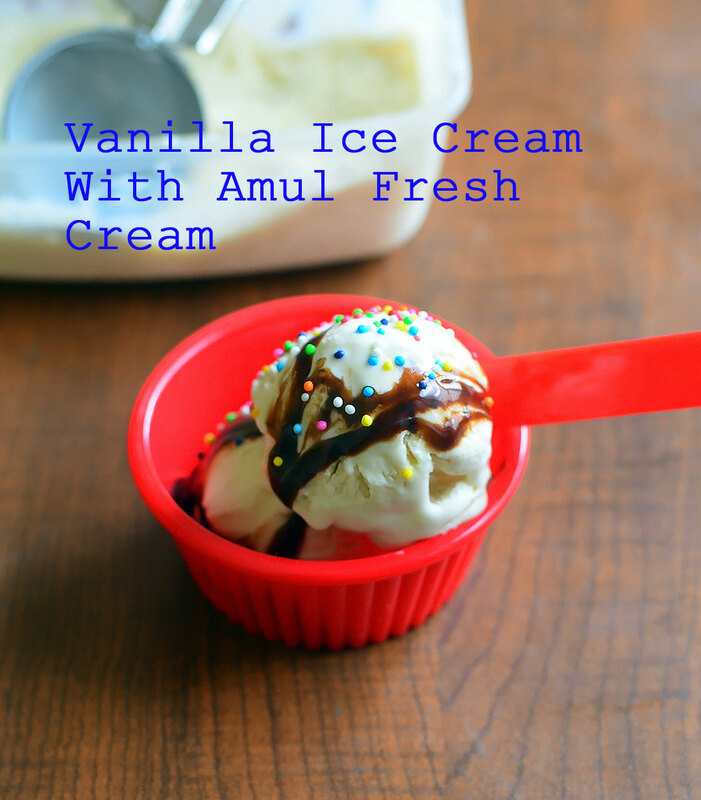 Yummy, rich, creamy, homemade, eggless vanilla ice cream using Amul Fresh cream and Condensed milk is ready. Enjoy with your favorite toppings ! 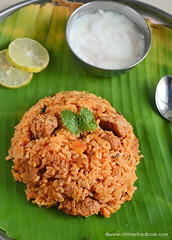 Here is my first recipe using mango this year. 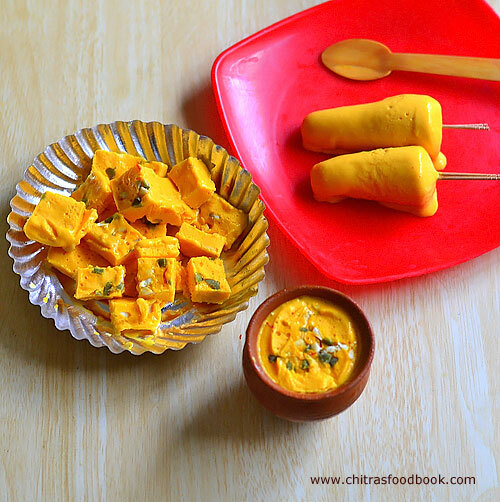 This is an easy, Instant Indian style no cook mango kulfi recipe with video using ripe mango, milk, milkmaid (condensed milk) and cream (Amul fresh cream or whipping cream). This is just a 2 step, grind and freeze recipe with minimal ingredients. I know I am late in starting mango recipes. But its better late than never, right 😉. 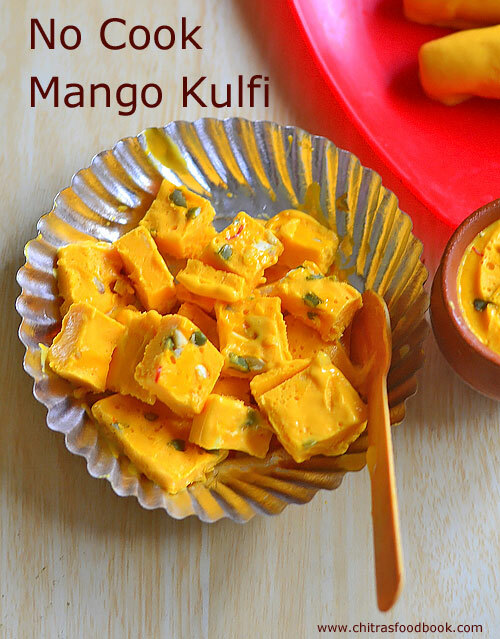 Whenever my fellow blogger friends posted this no cook mango kulfi recipe, I got tempted to try at home. Luckily I happened to taste a mango matka kulfi from a local ice cream shop nearby my house. I was able to guess the ingredients easily. 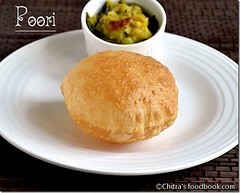 So based on the recipe in my mind, I browsed through and found Sharmilee’s recipe perfect to try. It came out very well as I expected. I prepared this kulfi in matka / mud pot, plastic kulfi moulds and in a small flat bowl to make serve as pieces. You can find all of them in the pictures. 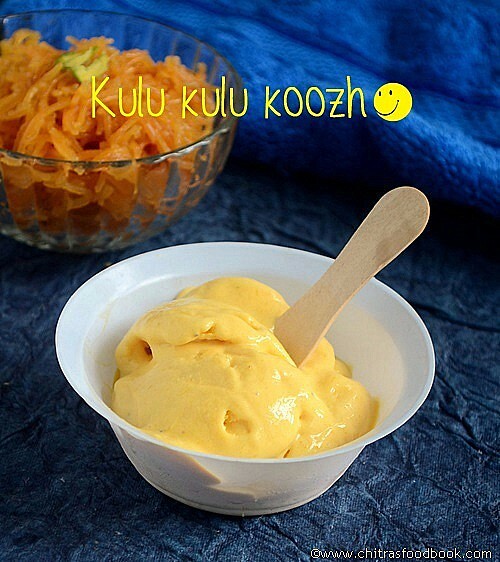 Friends, try this easy mango kulfi / mambazha kulfi for your kids. 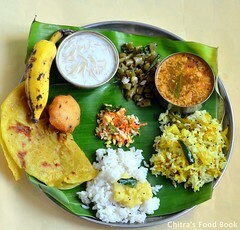 As this is a no cook recipe, kids would be interested to prepare it by themselves 😊. They will love its creamy texture and lovely color for sure. 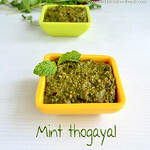 Let this be a healthy summer treat with mangoes for them. So lets see how to make mango kulfi recipe with condensed milk and fresh cream. Also check out my Eggless mango ice cream without ice cream maker, Mango rasayana, Mango kesari and mango payasam , Homemade mango Frooti drink, Aamras for Poori. Wash and peel the skin of ripe mango. Chop into cubes. Take chopped mango, condensed milk, milk, thick fresh cream, cardamom and saffron. Fill in plastic kulfi moulds or matka, cover with butter paper. Freeze for 6 to 8 hours. Remove and serve immediately. Enjoy ! Wash and peel the skin of ripe mango. Chop into small cubes. Take the chilled Amul fresh cream. Do not shake the pack. Cut open the pack and scoop out the thick portion of fresh cream. Do not use the liquid part for making ice cream. 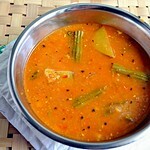 You can use the liquid part to add in the gravies for chapathi.Set aside. In a big mixie jar, take the chopped mango, condensed milk (milkmaid), boiled milk at room temperature, thick fresh cream, cardamom powder, saffron thread. Grind to a smooth paste without adding more milk or water. Grind in a low speed till everything becomes paste. Kulfi mixture is ready. Take the kulfi mould and fill in the kulfi mixture. If you don’t have kulfi mould, you can fill in small bowls or tumblers too. 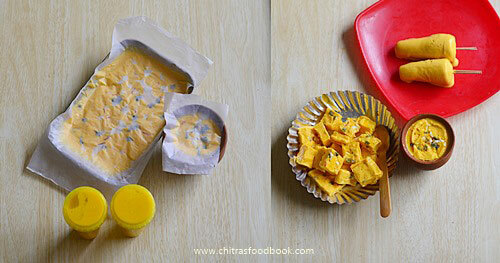 You can also pour the kulfi mixture in a flat bowl and cut into cubes as I did. Cover it with a butter paper. Make sure the butter paper touches the kulfi mixture. This helps to avoid ice crystals formation. Insert a popsicle stick and freeze for 6 to 8 hours. Overnight is the best. Remove the kulfi mould from the freezer and show it under tap water for few seconds OR insert the kulfi mould in a bowl full of water. Now you can unmould the kulfi easily. Serve immediately and Enjoy ! You can use Amul mithai mate or homemade condensed milk in this recipe. Adjust the quantity of condensed milk based on the sweetness of mango. If you don’t have fresh cream in hand, you can skip it but creaminess would be less. 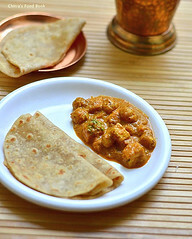 Instead you can add the skin / malai of milk. Use only the thick part of fresh cream. So do not shake the fresh cream before opening. Do not use hot milk while grinding, mixture may curdle. 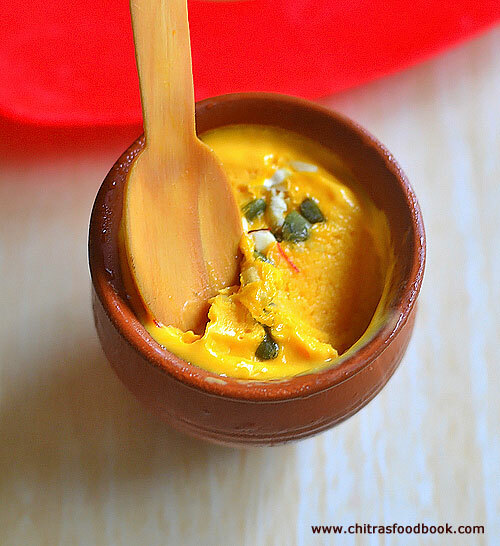 Easy, yummy, creamy mango kulfi – Enjoy ! This is my first post on popsicle recipes. So I wanted to share a very simple and quick popsicle recipe. 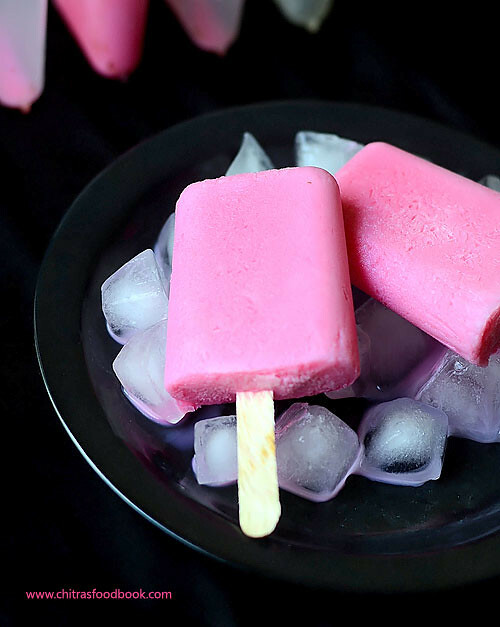 What else it could be other than rose milk popsicle. Rose milk is loved by adults and kids as well. Its a best summer drink and a healthy choice for kids. Some kids don’t like to drink it as milk. Instead serving it as a popsicle will sure attract them. 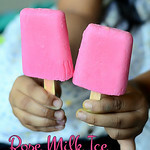 My daughter Raksha, who never drink Rose Milk tasted this popsicle and gave poses for my pics too . Do try this homemade easy popsicle recipe during this summer vacation for yourself & your kids and enjoy !! 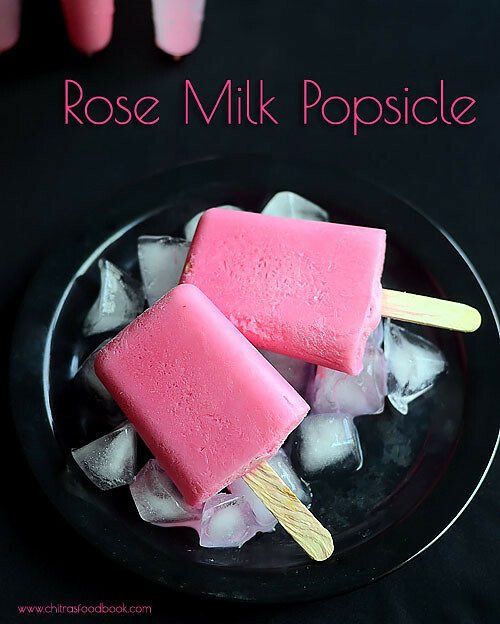 Lets see how to make rose milk popsicle at home. Boil milk and take 1 cup of it. Add sugar and few drops of rose essence as per the color you need. Mix well and let the milk cool down. Check for sweetness. Actually rose milk tastes sweeter than the frozen popsicle. So you should add more sugar than the usual quantity.Keep this in mind. Pour the milk into popsicle mould till 3/4 th. Cover it with a plastic sheet or zipwrap.Freeze it for 30 minutes.Open it once in the middle and insert the popsicle stick in the mould.Again freeze it for 30 minutes to 1 hour till its set completely. Take out and show the mould under running water for less than a minute.Remove the popsicle carefully and consume it immediately.Enjoy ! Add more or less sugar based on your taste. 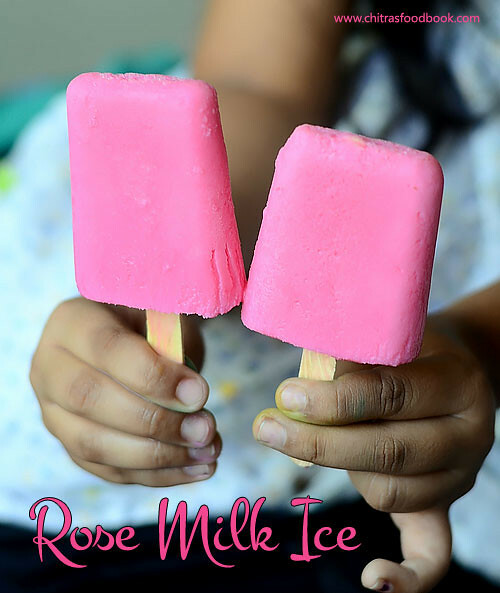 Actually rose milk popsicle tastes less sweeter than the rose milk. So you should add more sugar than the usual quantity. Try this easy popsicle at home and attract your kids . See who is enjoying it ?? Custard powder ice cream without ice cream machine was in my try list for long time.Last week when i posted mango ice cream,Raksha told me to prepare vanilla ice cream for her.When i was thinking about it,i reminded about this ice cream recipe which i had bookmarked from jeyashri’s kitchen long back.First time i halved her recipe and tried.But i din’t get it right.There were ice crystals and the ice cream was not soft as i expected.I couldn’t find out the proper reason too .Then i mailed jey and asked her for improvements.She is very sweet that she replied immediately and suggested me to add more custard powder as its quality may differ as per the brand.So this time i added little more custard powder & tried adding more fresh cream too.It came out very well.I was very happy with the result.We all loved it.More than us Raksha thoroughly enjoyed this ice cream and finished half the quantity i made .Do try this recipe for ur kids.I am sure they will enjoy this summer .This recipe makes a good base for any ice cream.Just run ur imaginations,add nuts or chocolate powder,make different flavours with it.Enjoy ! 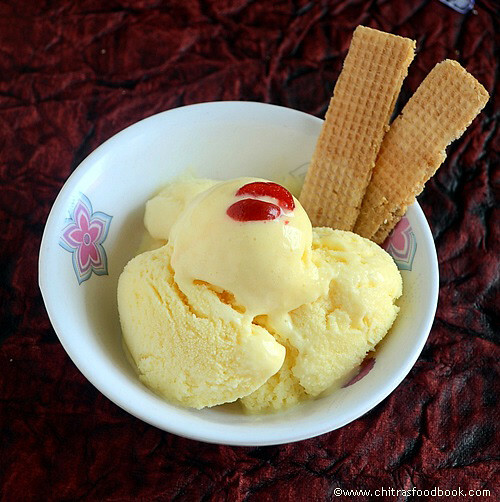 Custard powder ice cream recipe - Basic ice cream recipe with vanilla flavour. Reserve 4 tbsp from 2 cups of milk.Mix custard powder without lumps and set aside. Boil milk adding sugar and add the custard powder mixture.Boil for sometime till the milk thickens like dosa batter. Switch off the flame and cool it completely.Now add fresh cream and mix well. Whip it using a hand blender or mixie for few seconds till it becomes frothy. Transfer it to an air tight box and freeze it for one hour. After an hour,beat the mixture in mixie or blender for a minute.Again freeze it for 1 hour. Finally freeze it over night or 6 hours.Remove and keep outside for few minutes.Then scoop it. 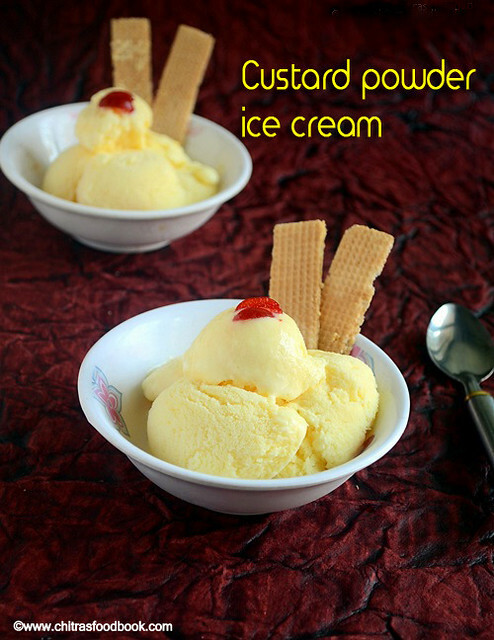 Custard powder ice cream is ready. U can add more fresh cream to get a creamier,rich ice cream. Do not add more custard powder as it may harden the ice cream. I used low fat milk.U can use full fat milk too. Adjust sugar and vanilla essence as per ur need. 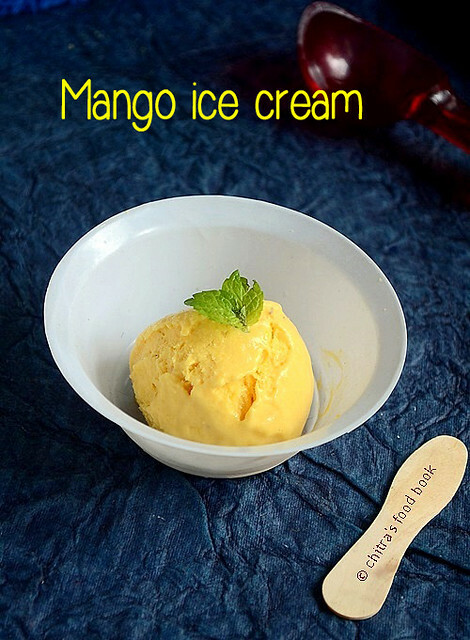 Mango ice cream recipe without ice cream maker, condensed milk & milk powder is my recent try in mango recipes. 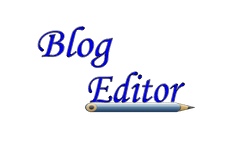 Last year I posted milk kulfi in my blog but this is my first post on ice cream recipes without ice cream machine. Making homemade ice cream recipe was like my dream. So last year I was searching for an ice cream maker online as well as in electronic stores here. I found cuisinart is very good but it was too costly for us.So i left the idea of buying it . 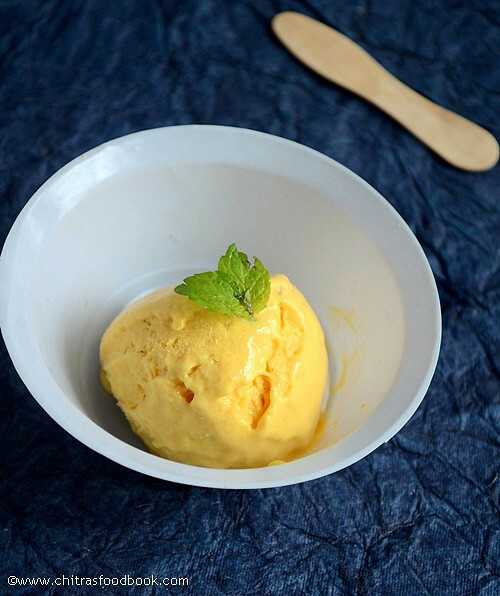 Then I started searching some ice cream recipes without ice cream maker.Recently i bookmarked this recipe from Swathi’s blog and Yes, finally I made this mango ice cream on my own . I still couldn't believe I made this without ice cream maker and condensed milk. It was so creamy and very tasty. It din’t melt quickly. So you can try this for birthday parties and for your guests as well. It was a super hit in my home. I had only two scoops left while taking the picture ;)). 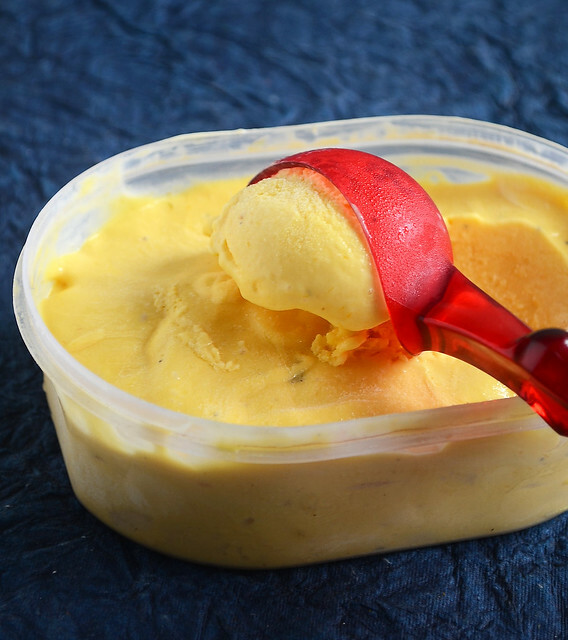 Check out my Custard powder ice cream without whipping cream and ice cream maker . 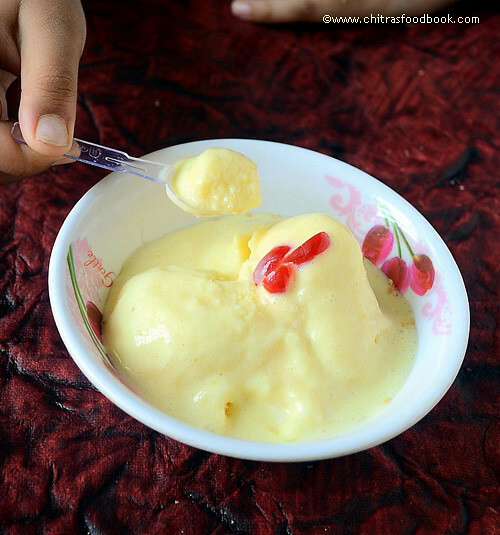 Also check out my Royal falooda ice cream with stepwise pictures ! 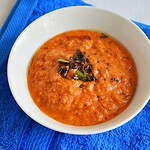 In this recipe, I used heavy whipping cream for the base as I had some lying in my fridge for long time. Soon i’ll share an ice cream recipe without using whipped cream. Let’s move on to the recipe..
Wash and peel the mangoes.Remove the pulp and grind it along with 2 tbsp of sugar ,few drops of lemon juice and cardamom seeds. In a wide bowl,take the whipping cream and the remaining sugar.Whip it using a hand blender.Whip in low speed till the cream thickens.Then whip in high speed for a minute till u get a soft peak. Now add milk & mango puree.Blend in low speed till they mix well.Do not blend for long time. Transfer to an air tight box & keep in refrigerator for 30 minutes.Then move it to freezer & keep it for 45 minutes. Now remove the box & beat the ice cream mixture in a mixie for few seconds.Transfer the mixture to the box and again freeze it for 45 minutes.Now beat again and repeat the same procedure for 5-6 times.Doing this helps to prevent the ice crystals and gives a creamy texture. Finally, cover the icecream with a butter paper. Seal the box and freeze the mixture for 5-6 hours or overnight. Yummy Mango Ice cream is ready to serve ! When u make this in ice cream maker, put the mixture in ice cream maker after the 3rd step and churn it as per the direction. Adding lemon juice is optional. But it helps to enhance the sweetness of mango. Add more sugar based on the taste of mango.